← If I file chapter 7 or 13 bankruptcy, how will it affect my credit in Ohio? You may have done some research on the topic of bankruptcy if it’s something you’re considering. The resources you’ve found might not provide complete details of how bankruptcy will affect you. That doesn’t mean that other material is unreliable; however, every situation is unique. The most valid information you can find about which options are available for your specific circumstances is to consult a bankruptcy lawyer. An attorney can best explain the different types of bankruptcy, evaluate your personal finances, and offer advice about the best course of action for you. If you want to know more about bankruptcy options, contact an attorney to schedule a free and confidential consultation. Myth #1: Bankruptcy destroys your credit. Fact: It is possible to improve your credit by filing for bankruptcy. When you are so far behind in your bills that you are in default, that most likely means that your credit has already been adversely affected. Your credit score can drop when your bankruptcy case is filed, but you will be able to start rebuilding it after your case discharges. Myth #2: Filing for bankruptcy means you’ll lose everything you own. Fact: Just because you’ve filed for bankruptcy, it doesn’t mean you’ll automatically lose your house, car, and other personal possessions. There are some allowable exemptions that can help you retain some of your property. If you have some personal property that you’d like to keep, speak with a bankruptcy lawyer about how you can hold on to it after filing for bankruptcy. Myth #3: It’s next to impossible to file for bankruptcy with the new laws. Fact: The bankruptcy laws enacted in 2005 were intended to reduce the amount of bad faith filings, but that doesn’t mean that you won’t be able to file. The court is not going to deny you if you’re a good candidate for bankruptcy. Begin by speaking with an attorney to see if you qualify. A means test may be used to establish your bankruptcy candidacy. Myth #4: Your spouse must also file if you’re married. Fact: Married couples are not required to file jointly. If you have more debt than your spouse, it may be a better option for you to file individually. However, if most of the debt is held jointly, it may be better to file for bankruptcy as a couple. Myth #5: Only people who don’t know how to manage money file for bankruptcy. Fact: There are various reasons why people file for bankruptcy. It doesn’t necessarily mean they are bad with money. Sometimes people reach the bankruptcy crossroad because they’ve experienced job loss, medical bills, or any number of other issues. They might have battled for many years to pay off the debt before they decide on bankruptcy. If you are struggling to make your bill payments, it may be time for you to seek an alternative. You might still be wondering if filing for bankruptcy is the right choice for you. 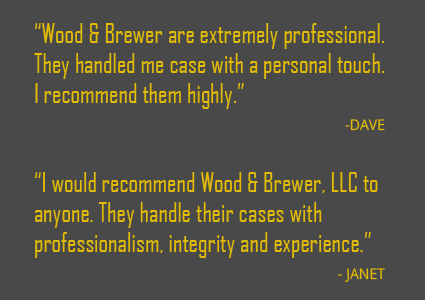 Use the information you’ve found in your research as a foundation for the questions you want to ask Wood & Brewer’s Attorneys. We would be happy to assist you with understanding the options and help guide you through the process. We offer a free consultation to review your debts and financial circumstances to aid you in reaching the decision that’s best for you. Call (614) 410-6878.